Democratic members of the House and Senate have sent three separate letters in the past three days to officials at the Defense and State departments and in the intelligence community, asking for an accounting of American involvement in a conflict that critics say has exposed the U.S. government to claims of responsibility for thousands of civilian deaths. Since Saudi Arabia, the United Arab Emirates and other members of a mostly Arab military coalition began a campaign against Yemen’s Houthi militants in 2015, the Pentagon has conducted aerial refueling of Persian Gulf planes and provided some intelligence support. [post_ads]But U.S. officials have sought to distance themselves from the operation as suffering has intensified in Yemen, where coalition pilots have repeatedly struck civilian sites and residents have fallen victim to increasing hunger and disease. In a letter on Monday to Gen. Joseph Votel, head of U.S. Central Command, Sen. Elizabeth Warren (D-Mass.) 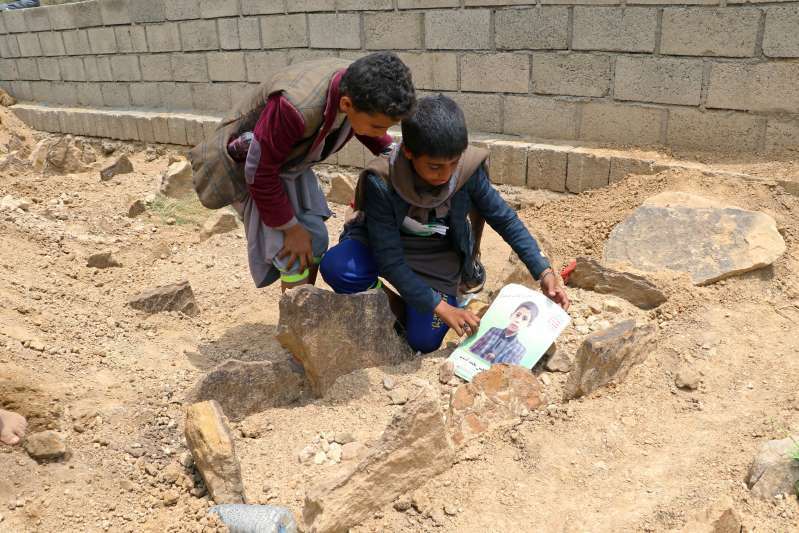 made reference to the bombing of a bus last Thursday in Yemen’s northern Saada province, which local officials said killed at least 40 children. In her letter, Warren asked Votel to clarify his recent assertion that Centcom is unable to determine whether the United States assisted specific coalition flights that resulted in civilian deaths. A recent report in The Intercept alleged that U.S. intelligence officials had detailed information about one such strike. In another letter on Tuesday, 30 House Democrats asked Defense Secretary Jim Mattis, Secretary of State Mike Pompeo and Daniel Coats, director of national intelligence, for a briefing about U.S. involvement in the war, including efforts to avert a battle in the coastal city of Hodeidah, a key humanitarian portal. In a third letter, Rep. Ted Lieu (D-Calif.), a former Air Force lawyer, on Monday appealed to the Defense Department inspector general to open an investigation into whether American military personnel have violated U.S. or international law by supporting the Saudi-led coalition. “I am deeply concerned that continued U.S. refueling, operational support functions, and weapons transfers could qualify as aiding and abetting these potential war crimes,” he wrote. The letters are the most recent expression of mounting congressional frustration about the war, most prominently among Democrats but also Republicans. On Monday, President Trump signed a defense authorization law containing a new bipartisan measure that requires the administration to ensure that Gulf nations are taking steps to protect civilians and end the war before the Pentagon can continue its support. Sen. Todd C. Young, an Indiana Republican who co-sponsored that measure, said he looked forward to monitoring the administration’s compliance with new Yemen requirements. “Our humanitarian principles and our national security interests require that the United States use its influence to end the civil war in Yemen and address the world’s largest humanitarian crisis,” he said in a statement. It’s not clear whether the administration intends to comply with that certification clause, which the White House flagged as one of several measures in the law it found objectionable. Congress has also focused on weapons sales in an effort to limit U.S. involvement in the war. New Jersey Sen. Robert Menendez, the top Democrat on the Senate Foreign Affairs Committee, has placed a hold on a proposed sale of precision munitions to Saudi Arabia and the UAE. Last week’s bus strike, which killed children on an end-of-summer excursion, has also galvanized opposition to the coalition’s conduct within the Trump administration, which has generally voiced strong support for its Gulf allies and echoed concerns about Iran’s links to the Houthis. According to U.S. officials, Saudi military personnel, who have publicly described the strike as a “legitimate military action,” told U.S. diplomats they targeted the bus because they believed it had two Houthi leaders aboard. A spokesperson for the National Security Council, who provided a statement on the condition of anonymity, said the administration would look forward to “timely and transparent” results from an ongoing Saudi investigation of the strike. A senior U.S. official, speaking to reporters in Cairo on Wednesday, said results of the Saudi-led investigation were expected in days but expressed doubts about the coalition’s ability and willingness to complete a probe in the desired manner. When pressed on why the United States could not ask Saudi Arabia, a close ally and major purchaser of U.S. arms, for such information, the official said it would require more U.S. manpower to oversee the Saudi inventory and how they use it. The official questioned whether anything would be gained by knowing the details of the U.S. role in each specific airstrike.